attn Erwin Baker. 05-60: Long Beach's J.H. Davies Bridge to nowhere, which stands across the Marine Stadium without approaches. 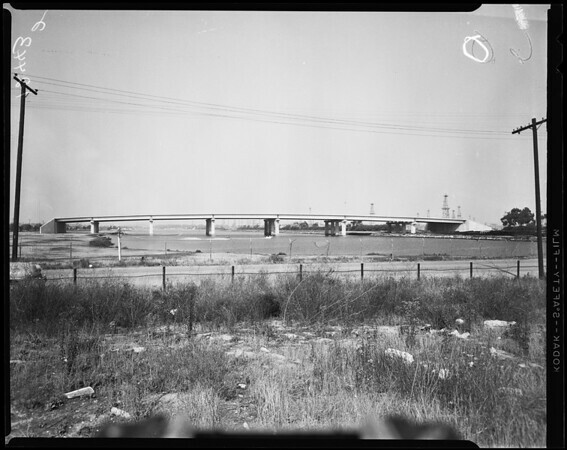 796-foot concrete bridge was contracted for on Oct. 5, 1954. Present structure was completed April 20, 1956. It cost Long Beach $1,167,106.04 but has never been used by automobiles -- only by seagulls and practising [sic] helicopter pilots. Long Beach city officials say compromise of litigation over land ownership may be forthcoming 'soon' so that needed approaches can be built 'within a year'".